Sidewalk Chalkboard Easel - 2-Sided - Ships Same Day! Included blackboards are 2-sided, write messages on both sides for easy change overs! This A frame menu board, sidewalk chalkboard easel helps you pull in customers or visitors by using street side advertising! The pavement sign makes use of (2) 900 x 600mm dual-sided blackboards, one for each side, to reach out to passersby. These black boards are textured and work with chalk sticks or liquid chalk markers, both of which can easily be erased using a damp cloth. You can write your messages on both sides of the display and then switch them out at the appropriate time to save valuable time with this versatile pavement sign. 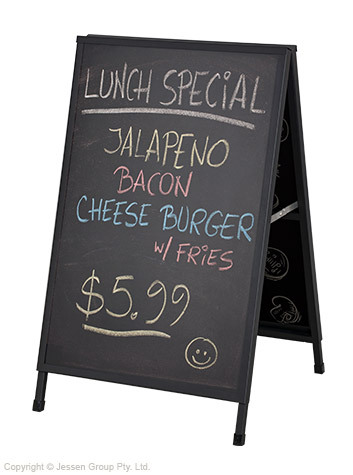 The sidewalk chalkboard easel is a dual-sided display to reach out to more customers at once from a single footprint. The signage has a slide-in design for quickly changing over the blackboards as mentioned above. There is a hinged lid as well to create a seamless look whilst protecting the boards during use. Whether used for a coffee shop, restaurant, retail store, car dealership, hotel or shopping centre, this display makes it easy to reach out to customers at a low price. This outdoor A frame is made from aluminium with a black finish that works well with the blackboards. The pavement sign has hinges on the inside that make setting up the portable display fast and easy with no tools required. You can collapse the signage small for storing it in between uses as well. Each leg has a rubber foot to help keep the stand in place once positioned. Order today by 2pm EST for same day Australia-wide despatch when in stock from Slimline Warehouse! Although this A-board is designed for outdoor sidewalk use, we advise that the blackboard panels are produced in sealed MDF wood which can be displayed outdoors under ideal weather conditions. To avoid chalk messages from washing off, or panels warping, we recommend bringing the sign in during inclement weather such as heavy rain or extreme heat.